View of the decks from below the house. 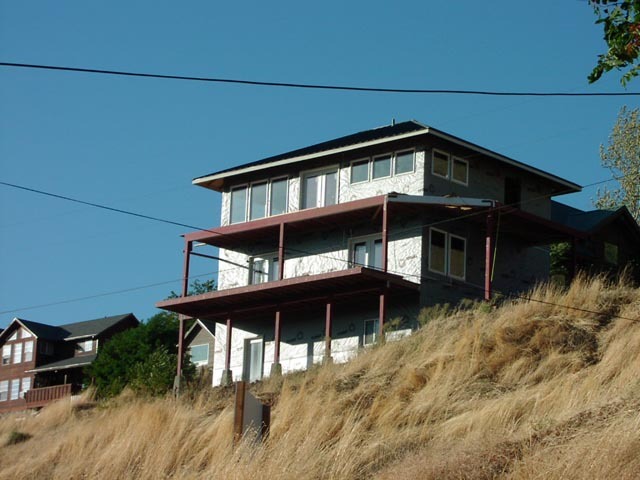 The decks brake up the tall monolith of the house and offer incredible views of the river and gorge. This year I'm starting first on the decks. 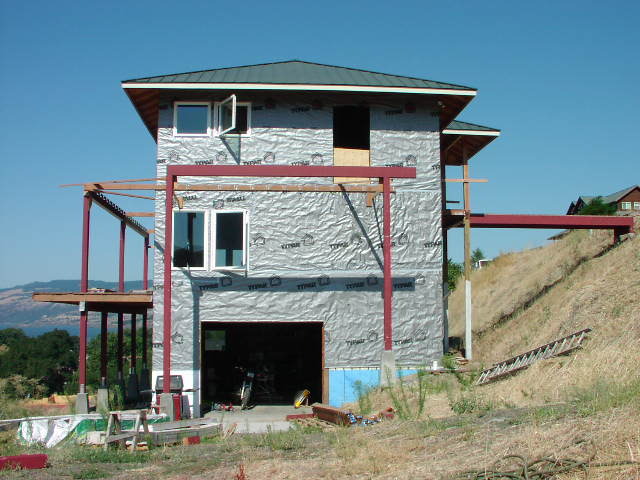 Once up they will assist in the siding of the house, the other major project I want to complete. Along the way, I hope to get stairs, french doors, some real plumbing, hot water, and an electrical service panel installed. So far I have dug 3 of 9 post holes for the piers that will support the deck posts. 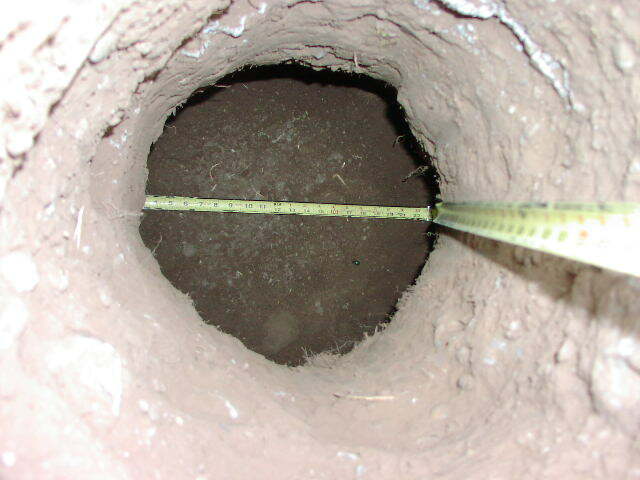 This one is impressive because it is 5 feet deep (to get down to undisturbed soil) and widens out to 24 inches across at the bottom (required to support the heavy deck loads). 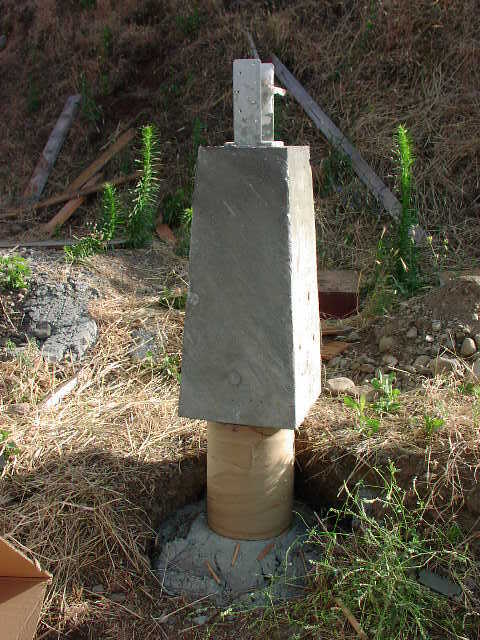 Here is one of the forms I'll use to pour the concrete piers. 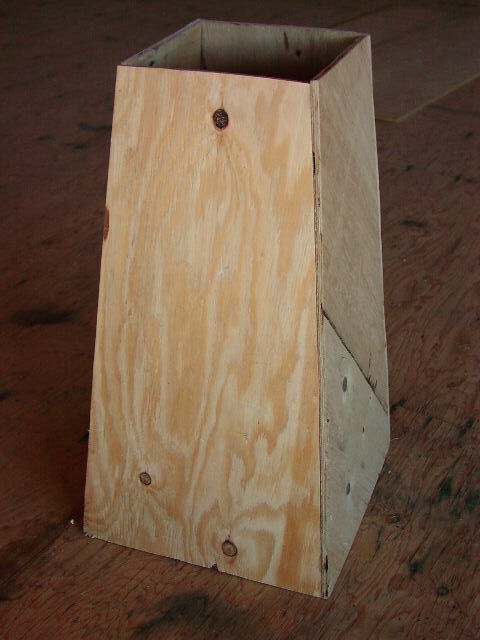 This is for the above ground portion onto which the 6x6 inch wooden post attaches. There will be 2 layers of decks across the full 32 foot South side of the house facing the river. The bedroom floor will have a 10 foot deep cantilevered deck. Above that, the main floor will have a 6 foot deep deck. 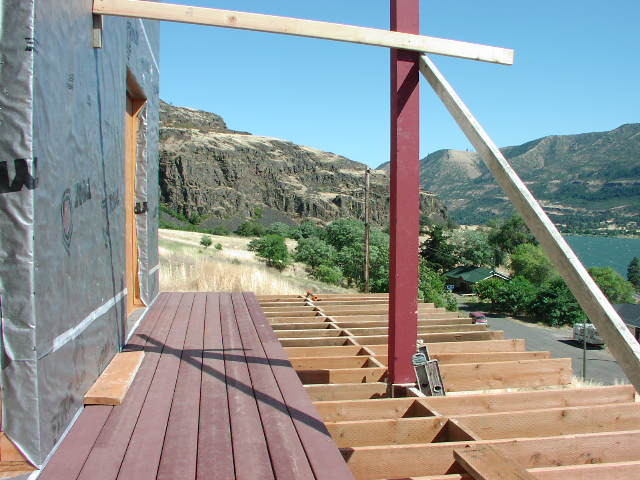 This upper deck will wrap around to the East side where there will be an 8x20 foot deck in the wind shadow of the house for barbequing and eating. 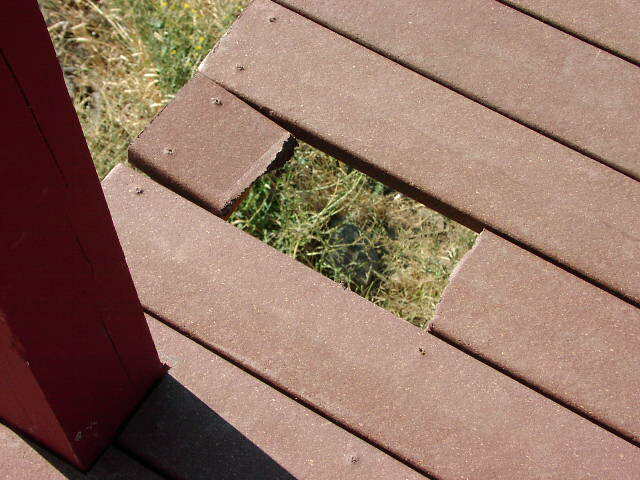 We are using a synthetic decking material called Trex. It is primarily made of recycled grocery bags and sawdust. It supposedly never needs maintenance. Counting the front entry porch and the bridge there will be about 850 sq. ft. of deck space. More than the entire footprint of the house. Progress as of 8/1/02. 10ft. 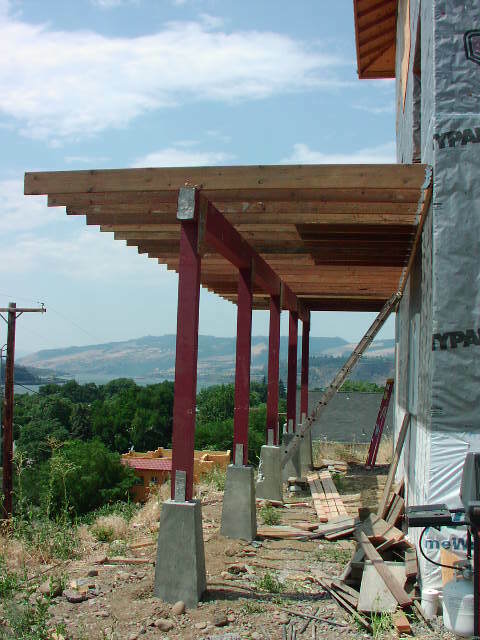 cantilevered deck structure is up. Some decking applied. 3 posts for next level installed (one shown). 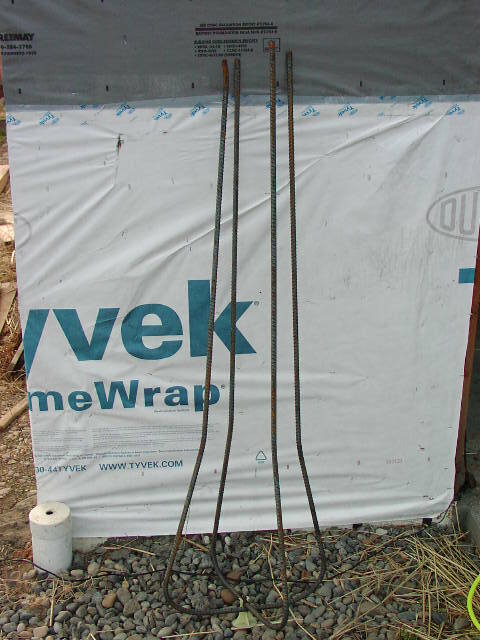 Here is a rebar reinforcement for the concrete piers that will support the decks. 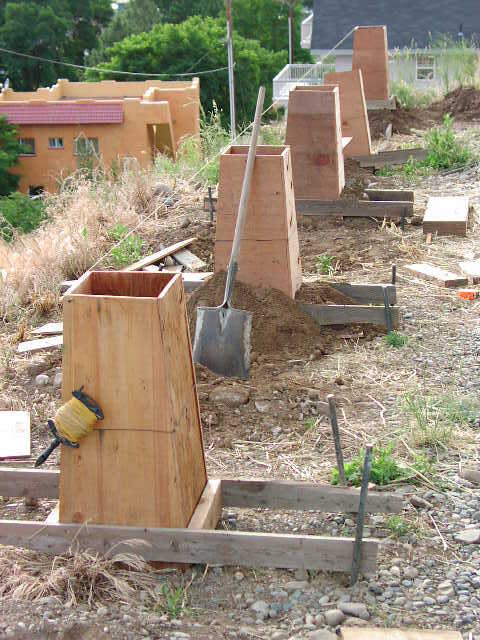 Here are the homemade concrete forms for the piers in the process of being lined, leveled and staked solid. The pour went off without a hitch. I used 4 cubic yards of concrete (an enormous amount) for 9 piers. Someday I'll cover the concrete piers with local stone. Note: The grade on this NE pier will be filled in to the base of the pyramid. 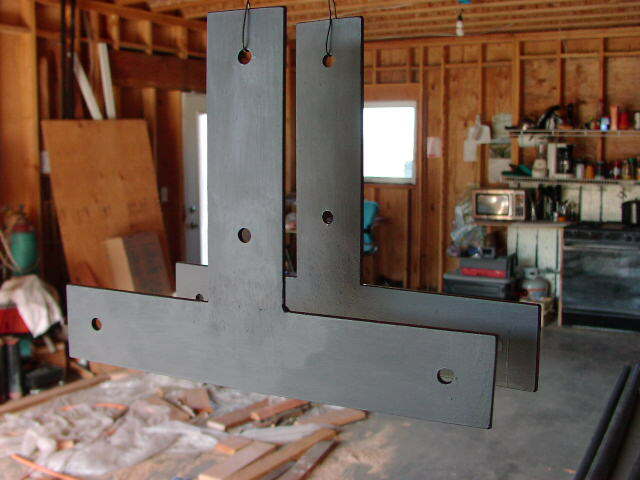 Here are some of the 1/4" brackets that tie the deck posts and beams together. "Red's" is a nearby shop/junkyard where they let me drill and weld these up for the cost of the steel. No worries about liability in the boonies. Note: They're hanging while the paint dries. 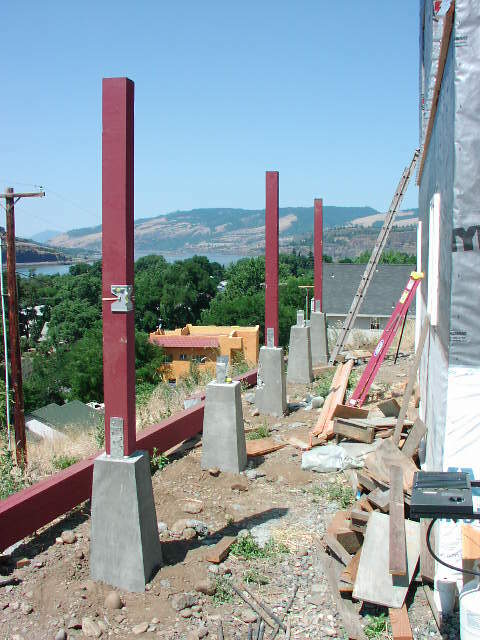 Here 3 of the 5 posts that will support the deck beams (on the ground) are installed. Because I was working alone, I had to lift each end of the beam on my shoulder while attaching a pipe clamp to hold it up. 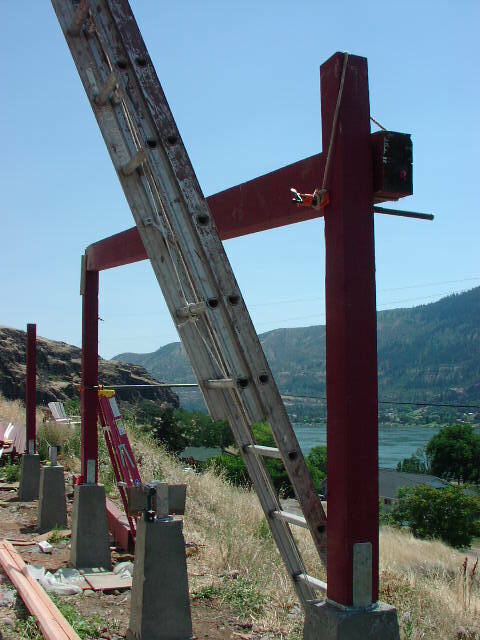 The beam sits about 11 feet off the ground. It came within an inch of falling off. I think I'll get help on the next level. The deck is taking shape. The joists are cantilevered over the beam and will be cut to length and tied together with a rim joist. Most of the joist boards were previously used for foundation footing forms and then for the temporary bridges before finally being put to permanent use. Here are the main beams for the decks. The upper decks don't have their joists installed yet. Note the bridge is mostly completed. This is what happens when you let a 16 foot 6x12" beam fall off its post while you're installing it ... and I got help lifting these.